A New Turn for the Doomsday Clock calls for a New Superhero! Home/Paul's Blog/A New Turn for the Doomsday Clock calls for a New Superhero! A few weeks ago, the famed “Doomsday Clock” clicked closer to midnight, shortening our date with destruction by 2 minutes. 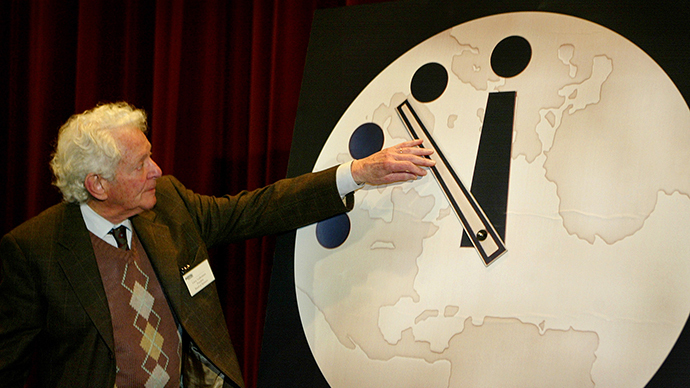 Created in 1947, as the nuclear threat was expanding, the doomsday clock is a way for leading scientists to show how close humanity seemed to be to being wiped off the face of the earth. Throughout the decades, the hands of the clock have gone back and forth, sometimes as far as 17 minutes away from midnight and sometimes just 2 minutes before. For most of the clock’s existence, the factors that moved the hands of the clock closer to midnight had to do with our advancing weapons of war, whose hands those weapons were in, the physical state of the weapons, and the level of conflict between armed nations. But last month, the hands were once again moved closer to midnight, placing us at three minutes before midnight, the closest we have been since 1984. But what is unique about this turn of the clock is what has precipitated it. It wasn’t just the potential of nuclear catastrophe. This year, the clock edged closer to midnight because of what the scientists called “unchecked climate change”. Is it really possible that climate change is as dangerous to human survival on this planet as nuclear war? Could it be that our time of apocalypse will not be some dramatic explosion, but rather, a choked out humanity going extinct with a whisper? It certainly isn’t as theatrical, and won’t make for good movies. We would like to imagine ourselves as some superhero, saving the earth by singlehanded actions to disarm or re-direct nuclear warheads, or to turn away destructive asteroids. But perhaps the best way for you to be the superhero that saves the earth is to use power saving light bulbs, plan your drives to conserve energy, and to reduce your own carbon footprint. Yes, it’s true that you probably won’t see your story on the big screen, but given the new issues that are moving the Doomsday Clock, it’s time for a new kind of Superhero! By Paul Kirbas|2019-02-18T17:10:55+00:00February 9th, 2015|Paul's Blog|Comments Off on A New Turn for the Doomsday Clock calls for a New Superhero!